The first Goodyear factory opened in Akron, Ohio, in 1898. The thirteen original employees manufactured bicycle and carriage tires, rubber horseshoe pads, and poker chips. The company grew with the advent of the automobile. In 1901 Frank Seiberling provided Henry Ford with racing tires. In 1903, Paul Weeks Litchfield was granted a patent for the first tubeless automobile tire. By 1908 Ford was outfitting his Model T with Goodyear tires. In 1909 Goodyear manufactured its first aircraft tire. 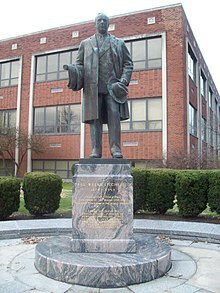 In 1924, Litchfield, as Goodyear Vice President, forged a joint venture with the German Luftschiffbau Zeppelin Company to form the Goodyear-Zeppelin Corporation. In the late 1920s to 1940, the company worked with Goodyear to build two Zeppelins in the United States and the Goodyear-Zeppelin Corporation was created to facilitate the relationship. The partnership continued even when Zeppelin was under Nazi control and only ended after World War II began. By 1926 Goodyear was the largest rubber company in the world. Only four years earlier it was forced to temporarily halt production of racing tires due to heavy competition. Nevertheless, the popularity of the Goodyear tire on the racing circuit led to a popular demand for the return of the brand. On August 5, 1927, Goodyear had its initial public offering and was listed on the New York Stock Exchange. By 1930 Goodyear had pioneered what would later become known as "tundra tires" for smaller aircraft — their so-called low inflation pressure "airwheel" aviation wheel-rim/tire sets were initially available in sizes up to 46 inches (117 cm) in diameter. For the next sixty years Goodyear grew to become a multinational corporation with multibillion-dollar earnings. It acquired their rival Kelly-Springfield Tire in 1935. During World War II Goodyear manufactured F4U Corsair fighter planes for the U.S. Military. Goodyear ranked 30th among United States corporations in the value of wartime production contracts. WWII forced the dissolution of the Goodyear-Zeppelin partnership in December 1940. By 1956 they owned and operated a nuclear processing plant in Ohio. In 1944, Goodyear created a subsidiary in Mexico in a joint venture with Compañía Hulera, S.A. de C.V., Compañía Hulera Goodyear-Oxo, S.A. de C.V. or Goodyear-Oxo. Of the five biggest U.S. tire firms in 1970, today only Goodyear remains independent, due to the challenge posed by radial tire technology, and the varied responses. At the time, the entire U.S. tire industry produced the older bias-ply technology. Estimates to fit the factories with a new set of machinery and tools for making this new product were between $600 million and $900 million. This was a substantial amount in a low margin business with sales revenue in the low billions. The U.S. market was slowly shifting towards the radial tire, as had already been the case in Europe and Asia. In 1968, Consumer Reports, an influential American magazine, acknowledged the superiority of radial construction, first developed in 1946 by Michelin. When Charles J. Pilliod Jr. became CEO in 1974, he faced a major investment decision regarding the radial tire, which today has a market share of nearly 100%. Despite heavy criticism at the time, Pilliod invested heavily in new factories and tooling to build the radial tire. Sam Gibara, who headed Goodyear from 1996 to 2003, has noted that without the action of Pilliod, Goodyear "wouldn't be around today." Sales for 1969 topped $3 billion, five years later sales topped $5 billion and it boasted operations in thirty-four countries. In 1978 the original Akron plant was converted into a Technical Center for research and design. By 1985 worldwide sales exceeded $10 billion. Goodyear Aerospace, a holding that developed from the Goodyear Aircraft Company after World War II designed a supercomputer for NASA's Goddard Spaceflight Center in 1979, the MPP. The subsidiary was sold in 1987 to the Loral Corp. as a result of restructuring. In 1987, Goodyear formed a business partnership with Canadian tire retailer Fountain Tire. In October 1986, Goodyear was a victim of a Greenmail attack. British financier James Goldsmith in conjunction with the investment group Hanson purchased 11.5% of Goodyear's outstanding common stock. They threatened to take the company over. On November 20, 1986, Goodyear acquired all of the 12,549,400 shares of stock held by Goldsmith's group at an above-market price of $49.50 per share. Goodyear also made a tender offer for up to 40 million shares of its stock from other shareholders at $50 per share. The tender offer resulted in Goodyear buying 40,435,764 shares of stock in February 1987. As a result, Goodyear took a charge of $224.6 million associated with a massive restructuring plan. The company closed plants in Cumberland, Maryland; New Toronto, Ontario, Canada; and Windsor, Vermont. It sold its Goodyear Aerospace business to Loral Corporation for $588 million and its Motor Wheel business to MWC Inc. for $175 million. Two subsidiaries involved in agricultural products, real estate development, and a resort hotel in Arizona were sold for $220.1 million. The company announced in summer 2009 that it will close its tire plant in the Philippines as part of a strategy to address uncompetitive manufacturing capacity globally by the end of the third quarter. In December 2018, Goodyear ceased operations in Venezuela due a lack of materials and rising costs resulting from hyperinflation. 1929: Introduction of first-known example of low-pressure tundra tires for aviation, invented by Alvin J. Musselman as Goodyear "Airwheels"
1967: Goodyear introduces the Polyglas tire, one of the first wide-tread bias-belted fiberglass tires, which along with similar tires from competitors such as the Firestone Wide-Oval would become regular equipment on 1970 to 1974 models, which would be superseded by radial tires beginning in 1975. 2015: Goodyear and Sumitomo announced that they would dissolve their worldwide partnership. Former Board members include James C. Boland and Rodney O'Neal. Richard Kramer is the chief executive officer and president of the company (since 2010), succeeding Robert J. Keegan. Following the military coup in Indonesia in 1965, His Excellency Suharto encouraged Goodyear to return and offered rubber resources and political prisoners as labor. In an NBC special aired in 1967, reporter Ted Yates aired footage showing former Communist rubber union workers escorted at gunpoint to the rubber plantation. Bad as things are in Indonesia, one positive fact is known. Indonesia has a fabulous potential wealth in natural resources and the New Order [the fascist regime headed by pro-U.S. General Suharto] wants it exploited. So they are returning the private properties expropriated by Sukarno's regime. Goodyear's Sumatran rubber empire is an example. It was seized [by the rubber workers] in retaliation for U.S. aggression in Vietnam in 1965. The rubber workers union was Communist-run, so after the coup many of them were killed or imprisoned. Some of the survivors, you see them here, still work the rubber -- but this time as prisoners, and at gunpoint. Main article: Ledbetter v. Goodyear Tire & Rubber Co.
Lilly Ledbetter was a supervisor at Goodyear Tire and Rubber's plant in Gadsden, Alabama, from 1979 until her retirement in 1998. For most of those years, she worked as an area manager, a position largely occupied by men. Initially, Ledbetter's salary was in line with the salaries of men performing substantially similar work. Over time, however, her pay slipped in comparison to the pay of male area managers with equal or less seniority. By the end of 1997, Ledbetter was the only woman working as an area manager and the pay discrepancy between Ledbetter and her 15 male counterparts was stark: Ledbetter was paid $3,727 per month; the lowest paid male area manager received $4,286 per month, the highest paid, $5,236. Lilly Ledbetter sued Goodyear claiming she was paid less than men doing the same work. She won the suit and was awarded $360,000, the jury deciding that Goodyear had clearly engaged in discrimination. The case was appealed to the Supreme Court. In Ledbetter v. Goodyear Tire & Rubber Co., 550 U.S. ___ (2007), Justice Alito held for the five-justice majority that employers are protected from lawsuits over race or gender pay discrimination if the claims are based on decisions made by the employer 180 days ago or more. The United States Congress overturned this decision by passing the Lilly Ledbetter Fair Pay Act of 2009 which was the first bill signed into law by President Obama. This was a case of statutory rather than constitutional interpretation. The plaintiff in this case, Lilly Ledbetter, characterized her situation as one where "disparate pay is received during the statutory limitations period, but is the result of intentionally discriminatory pay decisions that occurred outside the limitations period." In rejecting Ledbetter's appeal, the Supreme Court said that "she could have, and should have, sued" when the pay decisions were made, instead of waiting beyond the 180-day statutory charging period. Justice Ginsburg dissented from the opinion of the Court, joined by Justices Stevens, Souter, and Breyer. She argued against applying the 180-day limit to pay discrimination, because discrimination often occurs in small increments over large periods of time. Furthermore, the pay information of fellow workers is typically confidential and unavailable for comparison. Ginsburg argued that pay discrimination is inherently different from adverse actions, such as termination. Adverse actions are obvious, but small pay discrepancy is often difficult to recognize until more than 180 days of the pay change. Ginsburg argued that the broad remedial purpose of the statute was incompatible with the Court's "cramped" interpretation. Her dissent asserted that the employer had been, "Knowingly carrying past pay discrimination forward" during the 180-day charging period, and therefore could be held liable. Researchers at the University of Massachusetts Amherst identified Goodyear as the 19th-largest corporate producer of air pollution in the United States, with roughly 4.16 million lbs of toxins released into the air annually. Major pollutants included sulfuric acid, cobalt compounds, and chlorine. The Center for Public Integrity reports the Goodyear has been named as a potentially responsible party in at least 54 of the nation's Superfund toxic waste sites. On February 8, 2008, Goodyear announced the launch of an environmentally friendly tire produced using a cornstarch-based material. The Goodyear Eagle LS2000 partially replaces the traditional carbon black and silica with filler materials derived from corn starch thanks to "BioTRED compounding technology". The new technology increases the tires "flexibility and resistance to energy loss", which extend the tires life-span and lessen the impact on the environment. 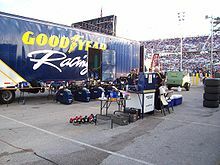 Similarly, Goodyear announced on April 22, 2008, that it had joined the U.S. Environmental Protection Agency's SmartWay Transport Partnership. The transport partnership is an attempt between the truck transportation industry and the EPA to reduce air pollution and greenhouse emissions as well as increase energy efficiency. The SmartWay partnership's tractors and trailers will use Goodyear's Fuel Max linehaul tires that increase fuel efficiency while reducing emissions. According to Goodyear and EPA officials "the fuel-efficient line-haul tires deliver up to 4% improved truck fuel economy, and when used with other SmartWay-qualified components, each 18- wheel tractor and trailer used in long-haul can produce savings of up to 4,000 gallons per year, or more than $11,000 annually." Goodyear's plants in Aurangabad and Ballabhgarh, India have received recognition for their excellence in energy conservation, efficiency and management with awards from both state and national governments. On February 24, 2015, Goodyear agreed to pay more than $16 million to settle Foreign Corrupt Practices Act "FCPA" charges that two of its African subsidiaries allegedly paid $3.2 million in bribes that generated $14,122,535 in illicit profits. The U.S. Securities and Exchange Commission "SEC" FCPA charges involved Goodyear subsidiaries in Kenya and Angola for allegedly paying bribes to government and private-sector workers in exchange for sales in each country. According to the SEC because "Goodyear did not prevent or detect these improper payments because it failed to implement adequate FCPA compliance controls at its subsidiaries" and, for the Kenyan subsidiary, "because it failed to conduct adequate due diligence" prior to its acquisition. It was not alleged that Goodyear had any involvement with or knowledge of its subsidiaries' improper conduct. Goodyear Tire Company mechanic shop in Goodlettsville, Tennessee. Veyance Technologies was purchased by ContiTech and no longer has the rights to Goodyear's licenses. Goodyear-branded wiper blades are made under license by Saver Automotive, in Ohio. The wipers were never under the Veyance umbrella. Wolverhampton, England NB Mixing center, retreading – This site has now begun to cease operations and will be completely closed by 2017. ^ "Goodyear Returns to Bicycle Tires". March 2, 2015. Retrieved January 19, 2018 – via www.bloomberg.com. ^ "Leading tyre manufacturers". Tyrepress. September 26, 2013. Retrieved March 13, 2018. ^ Terdiman, Daniel. "Goodyear bids goodbye to blimps, says hello to zeppelins". CNET. Retrieved December 30, 2014. ^ "FormulaSPEED2.0". Archived from the original on March 27, 2012. Retrieved December 29, 2011. ^ "History of DJIA, globalfinancialdata.com". Archived from the original on September 26, 2007. ^ a b c d "Goodyear History - Goodyear Corporate". www.goodyear.com. Retrieved January 19, 2018. ^ "Goodyear Zeppelin Company - Ohio History Central". www.ohiohistorycentral.org. Retrieved November 13, 2018. ^ "Flight Magazine, April 4, 1930 — The Goodyear Air Wheel, pgs. 404-405". flightglobal.com. Flightglobal/Archive. April 4, 1930. Retrieved October 23, 2013. ^ Peck, Merton J. & Scherer, Frederic M. The Weapons Acquisition Process: An Economic Analysis (1962), Harvard Business School, p. 619. ^ Sull, Donal (November 27, 2000). "The Dynamics of Standing Still: Firestone Tire & Rubber and the Radial Revolution". Harvard Business School. Retrieved June 27, 2016. ^ a b Tedlow, Richard. "Denial: Why Business Leaders Fail to Look Facts in the Face---and What to Do About It". Chapter 3. Portfolio Hardcover. March 4, 2010. ISBN 1591843138. ^ "A Tale of Two Tires". Bloomberg. ^ "History". www.jags.org. Retrieved January 19, 2018. ^ a b "Charles Pilliod Kept Goodyear Out of Rivals' Hands: 1918-2016 World War II bomber pilot led tire maker when it was besieged by Japanese and European competitors". Wall Street Journal. May 1, 2016. p. A6. Retrieved June 27, 2016. ^ "Corporate History - Fountain Tire". Fountain Tire. Retrieved January 19, 2018. ^ "25 years ago: Driving back the raider at the gates of Goodyear Tire and Rubber Co". Retrieved August 8, 2015. ^ Hicks, Jonathan P. (November 21, 1986). "GOODYEAR BUYS OUT GOLDSMITH". The New York Times. ISSN 0362-4331. Retrieved August 8, 2015. ^ Kirdahy, Matthew (July 10, 2008). "The 75 Most Reputable Companies in the U.S." Forbes.com. Forbes. Retrieved July 10, 2008. ^ "The Most Respected Companies in the United States - Reputation Institute Releases Results of its Global Pulse U.S. 2008 Study" (PDF). Reputation Institute. June 4, 2008. Archived from the original (PDF) on August 28, 2008. Retrieved June 4, 2008. ^ America's Most Admired Companies 2008 Retrieved March 17, 2008. ^ America's Most Trustworthy Companies Retrieved March 27, 2008. ^ Schaal, Dennis. "100 Best Corporate Citizens 2008". CRO Corp, LLC. Retrieved February 19, 2008. ^ "Goodyear to Close Philippines Tire Plant". finanznachrichten.de. Retrieved January 19, 2018. ^ a b c Dan (May 3, 2011). "The Goodyear Blimp will become Goodyear Zeppelin". Airships.net. Retrieved May 31, 2013. ^ "GOODYEAR, BRIDGESTONE JOIN FORCES TO FORM U.S. NATIONAL TIRE DISTRIBUTOR". corporate.goodyear.com. Retrieved July 18, 2018. ^ "Goodyear Says It Will Be Better Off Following Its Divorce From ATD". moderntiredealer.com. Retrieved July 18, 2018. ^ Breslin, John. "Citing 'character assassinations' of witnesses, Goodyear asks for new trial in $40 million asbestos case". Retrieved August 26, 2018. ^ "Bloomberg - Are you a robot?". www.bloomberg.com. Retrieved December 11, 2018. ^ "New Air Wheel Now on Market - Goodyear Device Does Away with Wheels". The Pittsburgh Press. Pittsburgh, PA USA: The Pittsburgh Post-Gazette. August 4, 1929. Retrieved March 26, 2014. ^ a b c d e f g h i j k l "Goodyear Board of Directors - Goodyear Corporate". www.goodyear.com. Retrieved January 19, 2018. ^ "Home - News, Entertainment, World Events Video - NBCUniversal Archives". NBCUniversal Archives. Retrieved January 19, 2018. ^ a b LEDBETTER v. GOODYEAR TIRE & RUBBER CO.(No. 05-1074) 421 F. 3d 1169, affirmed. ^ Day of vindication for grandma as pay law signed January 30, 2009 WASHINGTON (CNN). ^ Political Economy Research Institute Toxic 100 Archived 2011-10-01 at the Wayback Machine Retrieved August 14, 2007. ^ "Goodyear Launch Environmentally Friendly Tire With Corn Starch". Goodyear. February 8, 2008. Archived from the original on September 3, 2007. Retrieved May 6, 2008. ^ "Goodyear Joins U.S. EPA SmartWay Transport Partnership" April 22, 2008. Accessed May 6, 2008. ^ "Energy Conservation". Archived from the original on April 12, 2008. Retrieved May 6, 2008. ^ Pelletier, Paul; Tidman, Aaron; Haviland, Jane (February 25, 2015). "Goodyear's Settlement with the SEC Emphasizes the Importance of FCPA Due Diligence in M&A Transactions and of Having a Robust Anti-Corruption Policy". Mintz, Levin, Cohn, Ferris, Glovsky and Popeo, P.C. Retrieved March 2, 2015. ^ Horn, George (March 1, 2015). "M and A Due Diligence Failures: FCPA and Goodyear". The National Law Review. Barnes & Thornburg LLP. Retrieved March 2, 2015. ^ Mandelker, Sigal P.; Emert, Rochelle H.; Caraballo-Garrison, Phillip J. (February 27, 2015). "Goodyear Pays for Sins of Subsidiaries in $16 Million Settlement". Proskauer Rose LLP. Retrieved March 2, 2015. ^ "NHTSA Product Information Catalog and Vehicle Listing - Home". www.nhtsa.gov. Retrieved January 19, 2018. ^ "Global Presence - Goodyear Corporate". www.goodyear.com. Retrieved January 19, 2018. ^ "Goodyear to open mfg.-focused R&D center - Tire Business". tirebusiness.com. Retrieved January 19, 2018. ^ "Goodyear Shuts Down in Venezuela and Gives Tires as Severance". www.bloomberg.com. Retrieved December 17, 2018. ^ "300 jobs to go as Wolverhampton's Goodyear confirms closure". www.expressandstar.com. Retrieved January 19, 2018. Wikimedia Commons has media related to Goodyear Tire and Rubber Company.